Advocate General Sharpston’s opinion in Leno Merken BV v Hagelkruis Beheer BV (Case C-149/11) stated that the “use of a CTM within the borders of a single member state is not, of itself, necessarily sufficient to constitute genuine use of that trademark, because the territorial scope of the use is merely one of the factors to take into account in the assessment”. The eagerly awaited IP TRANSLATOR decision led to immediate changes in OHIM practice, but how will national offices react? ASEAN A memorandum of cooperation on industrial property has been concluded between the Association of Southeast Asian Nations (ASEAN) member state IP offices and the Japan Patent Office (JPO). 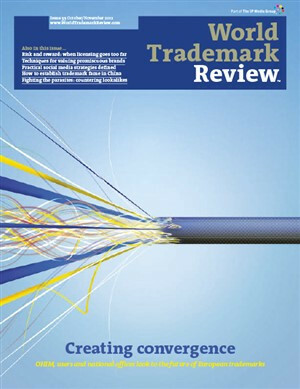 Advocate General Sharpston has handed down her opinion in Leno Merken BV v Hagelkruis Beheer BV (C-149/11, July 5 2012), advising that use of a Community trademark (CTM) within the borders of a single member state is not, of itself, necessarily sufficient to constitute ‘genuine use’ of that mark. Australia is to press ahead with its plain packaging law after the High Court rejected an appeal by British American Tobacco, Philip Morris, Japan Tobacco and Imperial Tobacco against the Tobacco Plain Packaging Act, which was approved by the Australian Senate in November 2011. The European Parliament has voted to reject the Anticounterfeiting Trade Agreement (ACTA). Despite a last-minute request to delay the vote until the ECJ has ruled on whether ACTA is compatible with EU law, Parliament had its say: there were 478 votes against the treaty, 39 in favour and 165 abstentions. The decision of the US Court of Appeals for the Seventh Circuit in Sunbeam Products Inc v Chicago American Manufacturing LLC (Case 11- 3920, July 9 2012) represents a major victory for trademark licensees. In Pie Optiek v Bureau Gevers (Case C-376/11, July 19 2012), the ECJ has held that agreements authorising the registration of ‘.eu’ domain names were more akin to contracts for services than to trademark licences, and that such ‘licensees’ should not have been allowed to register ‘.eu’ domain names during the sunrise period. ONEL: a genuinely useful opinion on the Community trademark? The advocate general’s opinion in Leno Merken BV v Hagelkruis Beheer BV addresses the issue of genuine use in the Community – but does it provide a usefully flexible test or one that is simply too uncertain to be helpful? Nothing lasts forever – or does it? With a thriving film industry in India, the expectation would be that publicity and image rights laws are firmly established. But is this the reality?